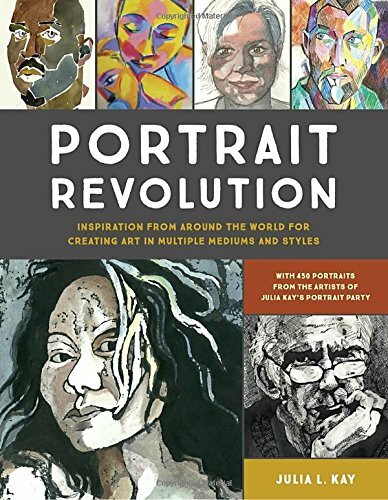 This book is a breath of fresh air in the world of portraiture art. I could see so much creativity and life in the drawings. This book collects 450 portraits from artists who participated in Julia Kay's Portrait Party (Flickr | Tumblr). From what I've read, that's 450 pieces of work curated out of 50,000 works created so far. The selection and variety showcased are great. There are portraits created in so many different media. There are pencils, coloured pencils, ballpoint, crayon, charcoal, ink, markers, digital and many more. The styles are also wide-ranging. There are realism, abstract, monochrome, cool and warm tones, contour drawings, collage, and many more. There are also different interpretation by artists of a particular person. For example, even Julia L. Kay's portrait was drawn by many other artists and it's fun to see what they can come up with. This is a fantastic book. I love the variety. I've been to a portrait museum once that featured many excellent portrait paintings. But somehow all the paintings just feel the same even if they may look different, and that's regardless of how technically accomplished the artist was. This book by comparison is a good example of what art and creativity is all about. Sometimes when you look at art, you want to be surprised, and this book is a pleasant surprise. I can highly recommend this to anyone who likes portrait art and those who like to draw people.